With a super nutty, slightly salty taste, adding hemp seed nutrition to your diet adds good taste and powerful nutrition! I absolutely adore these tiny, hearty hemp seeds numerous times throughout the week to add flavor to my meals. The hemp seed nutrition makes them an attractive food to add to your raw diet on a regular basis. You can eat them plain or as a delicious condiment. 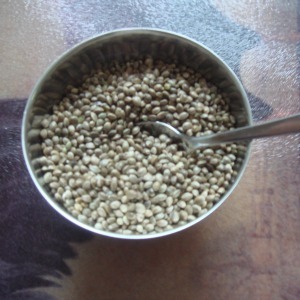 What you want is hulled hemp seeds, sometimes called hemp hearts. This is the seed with the tough outer layer (shell) removed. I have heard some people say that hemp seeds taste similar to pine nuts and they do have a nice nutty flavor and I just love that they are a 100% raw, gourmet product that has a hearty, groovy taste. Well, for starters...hemp seed protein is of exceptional quality because of its protein structure...hemp seeds have a whopping 33% easily digestible protein. This makes the protein easily and quickly absorbed into the body. Hemp seeds are LOADED with Omega-3 fatty acids, and are high in zinc. They have dietary fiber, and vitamins, primarily vitamin E.
Hemp seeds are an excellent source of all the Omega fatty acids, and the sometimes hard to get Omega-3 fatty acids. Get out your berkenstocks and get crazy...add to raw recipes such as soups, salads, cereal, veggies, salad dressings, granola, energy bars and smoothies. I sprinkle these hemp seeds on my salad several times a week, or on top of a simple vegetable to add flavor and to the presentation of the dish. 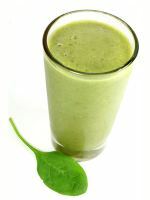 Make superfood smoothies, simply by adding this to any berry or green smoothie recipe! I use them in my raw desserts to add texture and taste. A good resource for purchasing hemp seeds is The Raw Food World. I think hemp seeds are a gift of nature...try them and you may too! 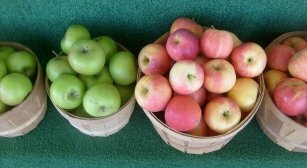 Interested in other Super Foods?